Logo used on aid delivered to European countries during the Marshall Plan, starting about 1948. The unwillingness of the Soviet Union to allow the creation of independent and democratic states in Eastern Europe, and the failure of East and West to reach a compromise on Germany, left many Americans—citizens and foreign policy experts alike—puzzled. Why were the Soviets acting as they did? Moreover, how should the United States respond? For most in the Truman administration, the proper policy was "containment"—in other words, Soviet aggression had to be met with firmness, otherwise the Russians would be emboldened to attempt further hostile acts. This lesson will consider containment through the use of original documents--mostly from the Truman Presidential Library--and an interactive map. They will study what it meant in theory, and then examine the first two major instances of its application—the Truman Doctrine and the Marshall Plan. By the end of 1946 serious differences had emerged between the West and the Soviet Union regarding the fate of postwar Germany and Eastern Europe. (For more information on this, see the previous lesson in this unit: "Sources of Discord, 1945–1946.") In the eyes of many Americans, members of the Truman administration as well as average citizens, the Soviets seemed bent on dominating much of the European continent in a manner reminiscent of that of Nazi Germany. The main question for U.S. policymakers was how to respond to Soviet aggression. With the recent experience of the late 1930s very much in mind, President Truman concluded that the Soviet Union was behaving like a bully and that the best way of dealing with a bully was to stand up to him. While there were some within the administration-namely Secretary of Commerce Henry Wallace—who dissented from this opinion, calling for greater understanding of the USSR's need for security, most policy makers found persuasive the arguments of White House Counsel Clark Clifford. In September 1946 Clifford sent Truman a memo in which he traced the history of U.S.-Soviet relations and offered a set of recommendations for foreign policy. His conclusion was that the Soviet leadership was convinced of the inevitability of war between the capitalist and the communist world, and as long as this was the case there was little hope for reaching mutual understanding with them. Instead, the United States had to "be prepared, while scrupulously avoiding any act which would be an excuse for the Soviets to begin a war, to resist vigorously and successfully any efforts of the U.S.S.R. to expand into areas vital to American security." This strategy, however, meant a radical new direction for U.S. foreign policy. The United States did not have a long tradition of direct intervention in European and Asian affairs. President Truman sought to prepare Americans for their new international role by announcing the so-called "Truman Doctrine" in 1947. The United States, he told Congress, should take responsibility for defending "free peoples" throughout the world from communist aggression. This policy first took concrete form as a substantial package of economic and military aid to Greece and Turkey, which were thought to be threatened by Soviet expansionist tendencies. However, Truman and his advisers believed communism to be more than merely a military threat. Postwar Europe remained economically devastated in 1947, leading to fears that communist parties might succeed in taking power through legal means in places like France, Germany, and Italy. In order to assist in Europe's recovery, the administration proposed the Marshall Plan—named for Secretary of State George C. Marshall, who introduced the concept in a June 1947 speech at Harvard University. The program was officially launched in 1948, and by the end of 1951 more than 13 billion dollars had been sent to Europe. While some economic historians have questioned how effective it was in actually promoting economic recovery, it certainly generated considerable good will toward the United States among the nations of Europe. For more information on the Marshall Plan, an excellent source is the Library of Congress site "For European Recovery", accessible via the EDSITEment-reviewed resource History Matters. By the end of 1947 it was clear that the United States was becoming involved in European affairs to an unprecedented extent. The strategy by this time had a name, which first appeared in an influential journal article by George Kennan. According to Kennan, a prominent State Department official who had spent years living in the Soviet Union, any aggressive moves on Stalin's part needed to be met with a policy of "containment"—firm resistance in the hope that, if communism were prevented from spreading, the Soviet system would ultimately change from within. Not everyone saw the adoption of "containment" as a positive development. Some Republicans, like Senator Robert A. Taft of Ohio, argued that the United States could become overextended by committing itself to the security of other countries. Columnist Walter Lippman, on the other hand, believed that containment would ultimately result in a "cold war" between the United States and the Soviet Union. Of course, this is precisely the term that would come to apply to the entire period between 1945 and 1989. Teachers seeking additional background on the development of containment are encouraged to visit "The Ideological Foundations of the Cold War," located at the EDSITEment-reviewed site of the Truman Presidential Library. NCSS. D1.1.9-12. Explain how a question reflects an enduring issue in the field. NCSS. D1.2.9-12. Explain points of agreement and disagreement experts have about interpretations and applications of disciplinary concepts and ideas associated with a compelling question. NCSS.D2.His.1.9-12. Evaluate how historical events and developments were shaped by unique circumstances of time and place as well as broader historical contexts. NCSS.D3.1.9-12. Gather relevant information from multiple sources representing a wide range of views while using the origin, authority, structure, context, and corroborative value of the sources to guide the selection. NCSS.D4.1.9-12. Construct arguments using precise and knowledgeable claims, with evidence from multiple sources, while acknowledging counterclaims and evidentiary weaknesses. You should also become familiar with the interactive map which accompanies this lesson. This shows the sequence of events in Europe during the early years of the Cold War, as well as their geographic locations. By clicking on the numbered locations pop-ups will appear with more information. This lesson will encompass numbers 8 through 13. In the first activity students will learn what was meant by "containment" by reading excerpts from two famous documents, the first Clark Clifford's 1946 memo to President Truman and the second a 1947 article by State Department official George Kennan. Both are available in their entirety by way of the EDSITEment-reviewed site of the Truman Presidential Library, but excerpts are included on pages 2-5 of the Text Document that accompanies this lesson. Note that these are challenging documents, even for advanced students, because they deal with Marxist ideology. Teachers are advised to guide their students through them during class rather than assigning them as homework. One method of doing this might be to pick individual students to read a paragraph aloud, and then try to put it in their own words. If students have not completed the previous lesson in this unit—"Sources of Discord, 1945-1946"—they should, by way of introduction, get a brief review of how U.S.-Soviet relations had deteriorated since the end of World War II. A good way of doing this is to have them consult the interactive map and read the text of the popups at locations #1 through 7. Central to both documents is the Marxist idea that capitalism and communism can never peacefully coexist; that, in fact, capitalism is doomed, and that historical forces would ultimately bring about the worldwide triumph of communism. A very readable account of why and how this would happen is "The Manifesto of the Communist Party" by Karl Marx and Friedrich Engels. According to both Clifford and Kennan, the belief of the Soviet leadership in the evils of capitalism, and in inevitability of a capitalist collapse, was critical to understanding Soviet behavior. While Stalin and the other leaders of the Soviet Union rejected the idea of long-term cooperation with the capitalist West, and used the ongoing struggle against capitalism as a justification for their repressive policies at home, they still believed that time was on their side. This meant, Kennan believed, that if they were challenged forcefully the Soviets would back off from any aggressive moves rather than risk war. But if they were thwarted enough times, perhaps some kind of change could come from within—in other words, the system might become more willing to accommodate the outside world. Why, according to Clifford, was there little chance of reaching any sort of understanding with the Soviets anytime soon? How, according to Clifford, could the United States expect the Soviet Union to behave in international affairs? How, in Clifford's view, should the United States respond to this anticipated Soviet behavior? According to Clifford, what advantage did the Soviet system of government have over that of American democracy? What did this imply for U.S. foreign policy? What did Kennan mean by "containment"? Why did he think it would work? Why did Kennan believe that "threats or blustering" would be ineffective in stopping Soviet aggression? What did Kennan predict might happen in the Soviet Union if containment were practiced consistently? As mentioned above, the ideas expressed in the Clifford memo and the Kennan article had a profound influence on the Truman administration. Specifically they would help to shape the U.S. response to two crises that emerged early in 1947. This activity will focus on the first of these crises, while the next activity will concentrate on the second. Students should begin this activity by consulting locations #8, 10, and 12 on the interactive map which will give them some background on developments in Greece and Turkey during 1946 and 1947. Next students will read documents pertaining to the so-called "Truman Doctrine," in which the president pledged the country to "support free peoples who are resisting attempted subjugation by armed minorities or by outside pressures." Divide the class into two groups; the first will read excerpts from a speech by Truman in which the president makes his case for why the United States should provide aid to the governments of Greece and Turkey. The second group, meanwhile, will read excerpts from a speech by Henry A. Wallace. Wallace—former vice president, Secretary of Agriculture, and Secretary of Commerce—had by this time emerged as the leading left-wing critic of Truman's foreign policy. Both documents are available at Teaching American History; however, excerpts of these documents may be found on pages 5-10 of the Text Document. Students should read the above selections as homework and should be instructed to come to class prepared to discuss the assignment. In class have students pair off so that each member of Group #1 works with a member of Group #2. Their job is to evaluate Truman's proposal through a silent debate. Using the worksheet provided on page 9 of the Text Document, the Group #1 member should begin by writing in the left-hand column a reason why the United States should assist Greece and Turkey. The Group #2 member should then counter by offering a reason why Congress should reject this policy. This should continue until both sides run out of reasons. Teachers should conclude this activity by having a class discussion focusing on how the Truman Doctrine might be considered an example of containment in action. Students should also be asked to give their opinion on whether this was a wise policy. Finally, teachers should direct students' attention to the following critical line from Truman's speech: "I believe that it must be the policy of the United States to support free peoples who are resisting attempted subjugation by armed minorities or by outside pressures." This line has important implications for how the United States has conducted its foreign policy ever since. Students should be encouraged to think about what this means, as well as the advantages or disadvantages of following such a guideline. They might also be asked to consider whether Truman intended this guideline to apply to subjugation of any kind, or specifically to communist aggression. The Truman Administration's second effort to implement containment was the Marshall Plan, a vast program of economic aid to Europe in order to rebuild the economies that had been devastated by the war. This, too, had containment of the Soviet Union as its ultimate objective, since it was feared that economic distress would make communism more appealing to ordinary people. Many in the administration believed that poor economic conditions might lead to communist parties taking power in Western Europe through peaceful electoral means. Begin the activity by having students consult once again the interactive map, this time looking at location #11. This will give them some background about the economic conditions Europe faced as a result of the severe winter of 1947. For this activity students will look at several documents and political cartoons related to the Marshall Plan. As in the previous activity, these should be assigned as homework for the night before. Complete versions are located at the sites listed below; excerpts from the first two, however, may be found on pages 10-12 of the Text Document. Using these documents, students should imagine that the year is 1947 or 1948, and then write a three-paragraph letter to President Truman in which they indicate either their support or their opposition to the Marshall Plan. To wrap up the exercise, teachers should lead a class discussion on the Marshall Plan and how it fit into the strategy of containment. It may be helpful to return to the two documents used in Activity 1, and ask whether the students think that Clifford and Kennan would have approved of the Marshall Plan (they did). What did George Kennan mean by "containment"? Why did he think it would be a successful strategy? What was the Truman Doctrine and how did it come about? What was the Marshall Plan and how did it come about? How had U.S. policy toward Europe changed by the end of 1947? Why did this change occur? Alternatively, teachers might combine the above into a single larger question: Analyze the policy of containment. What were its strengths and weaknesses? What steps did the Truman Administration take to implement it? Aside from specific objections to the Truman Doctrine and the Marshall Plan, the larger strategy of containment had its critics. Probably the most prominent of these was Walter Lippman, who in 1947 was arguably the country's most respected political columnist. It was Lippman, in fact, who coined the term "cold war" to refer to the ongoing tensions between the United States and the Soviet Union. Lippman wrote a series of columns criticizing containment; excerpts from one may be found at Teaching American History. Students might, after reading this essay, be asked to consider whether the predictions Lippman made proved to be correct-and whether this serves as a valid refutation of Kennan's points. In his 1969 memoirs former Secretary of State Dean Acheson wrote about the origins of the Truman Doctrine; relevant excerpts are available at Teaching American History. Teachers might wish to have their students consider this along with a chronology by Truman speechwriter Joseph Jones outlining the process through which the Truman Doctrine speech was written. This may be found at the site of the Truman Presidential Library. Both of these documents provide insight into American domestic politics at the time, as they suggest that Truman deliberately overstated the Soviet threat in order to rouse a reluctant Republican-led Congress to action. Likewise, teachers may wish to have students explore the background to the Marshall Plan. A large number of documents related to this are available at the Truman Presidential Library; of particular importance are speechwriter Joseph Jones's "Notes on the Economics of Peace" and Truman's September 30, 1947 letter to his wife Bess. Students might be asked to compare and contrast the two, and to consider how a historian might use them. 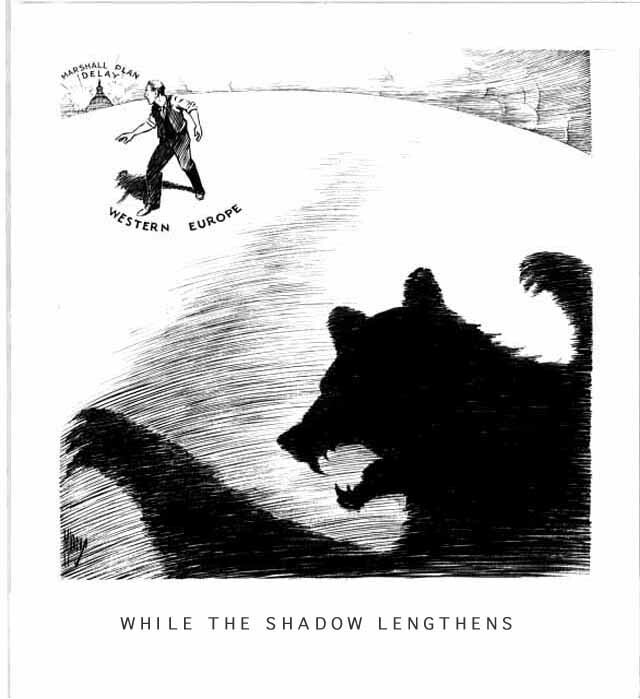 Excerpts from Walter Lippman, "The Cold War"
Herblock Cartoon, "It's the Same Thing, Without the Mechanical Problems"
In the spring of 1948 Stalin provoked the first serious international crisis of the Cold War by announcing a blockade of West Berlin. This lesson will trace the Berlin blockade and airlift of 1948–49 and the establishment of NATO. Articulate the meaning and origins of the strategy of containment. Analyze the competing perspectives regarding Truman's Cold War policies. Evaluate the short and long-term outcomes of the Truman Doctrine and the Marshall Plan. To what extent was containment successful?